ZAMBOANGA DEL NORTE, Philippines (Mindanao Examiner / Mar. 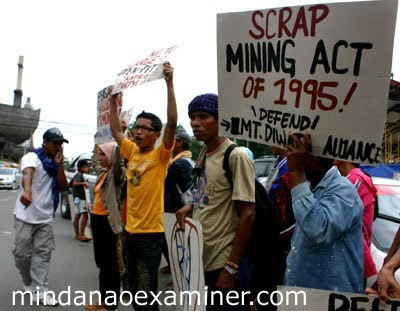 3, 2011) – Various Filipino civil society groups, backed by the influential Catholic Church and lawmakers, are pushing for the scrapping of the Mining Act of 1995. 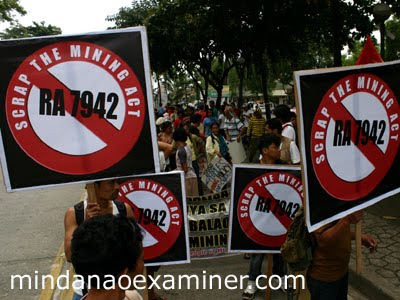 They are also urging Congress to pass a new mining law, saying for more than a decade and a half, contrary to the promises of development and prosperity that comes with the enactment of the Mining Act of 1995, the people have only witnessed and become victims of the havoc that the foreign-dominated mining industry has brought to the country. Judy Pasimio, Executive Director of Legal Rights and Natural Resources Center, said human rights violations among indigenous peoples and communities, mining-related extrajudicial killings, division amongst communities, environmental destructions, cases of bribery amongst government institutions, non-payment of taxes, and undermining of local governance have all been main-stay features under the 16th year history of the mining law. 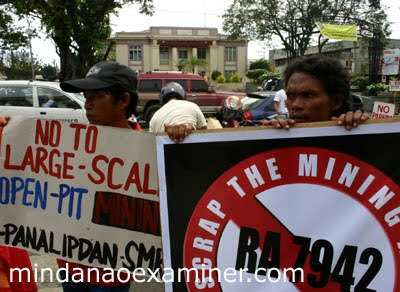 The conveners of the Minerals Management Bill Now Network also said mining-affected communities have banded with the Catholic Church, Congressional representatives, peoples organizations, environmental and human rights groups to call for the scrapping of the highly contested mining law and push for the immediate enactment of a new mining law. Bishop Broderick Pabillo, Auxilliary Bishop of the Archdiocese of Manila, said they have consistently called for such action in the past. 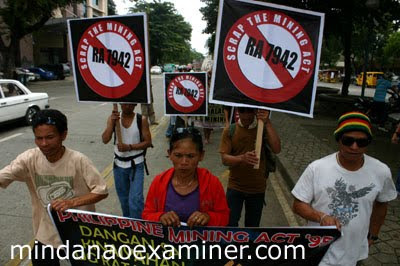 “The Catholic Bishops Conference of the Philippines issued pastoral statements in 1998 and 2006, calling for the repeal of the Philippine Mining Act of 1995. As pastors, we have witnessed how the faithful has struggled to defend the integrity of creation. Our experiences of environmental tragedies belie claims and assurances of responsible mining,” Pabillo said. Bishop Deogracias Iniguez, spokesperson for the CBCP, and Bishop of the Diocese of Caloocan, observed that mining areas remain among the poorest areas in the country. Iniguez also cited the lament of many bishops that the indigenous peoples face serious challenges when confronted with mining as “the cultural fabric of indigenous peoples is also being destroyed by the entry of mining corporations”. 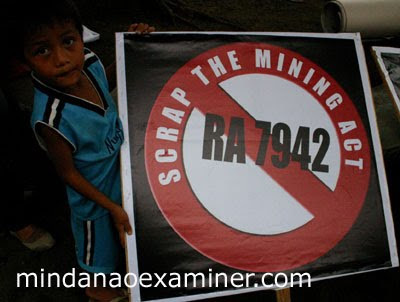 Mining-affected communities and advocates have found their allies as House Bill 206 and House Bill 3763, both pushing for a new mining law, were filed in July 1, 2010 and December 1, 2010 respectively. The authors of the bills are Reps. Erin Tanada III for HB 206 or the Alternative Mining Bill and Kaka Bag-ao, Walden Bello of Akbayan Partylist, Teddy Baguilat Jr. of Ifugao, Rufus Rodriguez, Maximo Rodriguez, Carlos Padilla and Roilo Golez for HB 3763 or the Minerals Management Bill. Additional Congress representatives have since joined the cause.